Apple will further its endorsement of YouTube and open video standards by building support for the Google-owned video sharing service into one of its flagship applications due to ship later this summer as part of Mac OS X 10.6 Snow Leopard. On the heels of screen recording discoveries in the upcoming version of QuickTime X Player, people familiar with betas of the media player software say a handful of video sharing options will also be rolled into the release. In particular, the application will let users take any supported video file and upload it directly to YouTube. 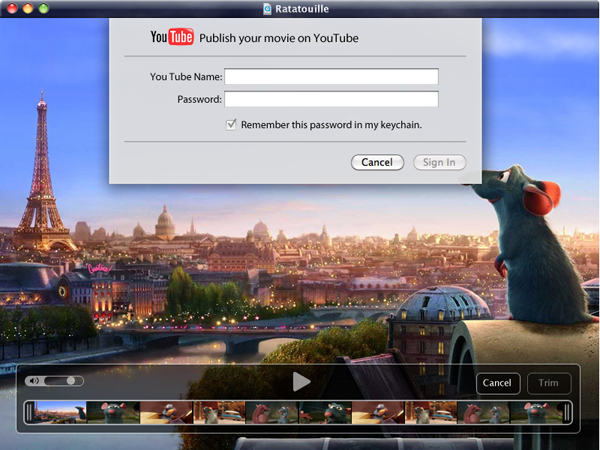 Users will be prompted to enter their YouTube username and password, and QuickTime X Player will take care of the rest. This includes converting the movie into a file optimized for the video sharing service and then uploading it to the appropriate user account. Of course, Apple will also offer a similar option for users of its own MobileMe service that will take video files and upload them to a MobileMe Gallery. Both options are reportedly accessible via a new "Share" menu in the QuickTime X Player interface. That same menu will also see the relocation of several video saving options currently tucked away in the "Export..." dialog of QuickTime Player 7.6, such as exporting videos in formats suited for playback on iPhones, iPods, and Apple TV. In these cases, videos will be converted to their appropriate format and added to the user's iTunes library, where they'll then sync to the various media devices. With the arrival of YouTube support in QuickTime X Player, Apple will offer built-in support for the third-party video service across all three of its core business segments. The Cupertino-based electronics maker made YouTube a staple of its iPhone experience from the onset with a custom application for browsing videos on the service and later added similar capabilities to its Apple TV set-top-box. Google, which owns and operates the YouTube service, has been one of Apple's strongest allies in pushing adoption of open Web standards. As part of its agreement with the iPhone maker to include a YouTube application on the touch-screen handset, the search giant agreed to begin converting its vast video archive from Adobe's proprietary Flash format to the H.264 standard. The partnership has helped strengthen Apple's argument against the need for a version of Flash capable of running on its multi-touch platform, as it wants those device to remain free of any dependence on Adobe.